We’ve done a massive overhaul of how TeamSnap handles email addresses, phone numbers and additional contacts on the Roster. It’s sophisticated, flexible and powerful and we think you’re going to love it. It eliminates some of the workarounds that youth teams have had to make to get multiple parents listed with their kids, and for anyone with extra email addresses, phone numbers or cell phones it’s going to make your TeamSnap experience better too. Previously, in order to list multiple emails on the Roster you had to separate them in one field with a comma. This was inconvenient, ugly and occasionally buggy. Under the new system, you can add an unlimited number of email addresses for your roster record, each neatly in its own field, and with a label so you can differentiate between home, work and alternate emails. For each email, you can decide whether to make it public to the rest of your team or private to just you and your team manager(s). AND you can decide for each email address whether it receives team emails. You have complete control. We’ve also changed how phone numbers are handled so you can list unlimited phones with your Roster record. Home, work, mobile, fax, toll-free, office, Skype … no matter how many phone numbers you have, now you can list them all, each with its own label. And if you have multiple cell phones, you can decide for each one whether it receives text messages from the team. Here’s where it gets really cool (and especially useful for youth teams). You can also list unlimited contacts with each Roster record. Add completely separate contact information (name, address, phones, emails) for Dad, Mom, Grandma, spouse, legal guardian or anyone you want listed with your Roster record. And just like the main Roster record, each of those additional contacts can have unlimited phones and emails. You asked for it and it’s coming … multiple logins per Roster. Here’s the issue: A lot of TeamSnap users are youth teams where BOTH parents need access to their child’s team. But in many cases, for security or privacy reasons, the parents don’t want to share their TeamSnap login with each other. Coming soon, you’ll be able to take each of those additional contacts you’ve listed and give them their own login access to your Roster record. Both Mom and Dad will be able to manage Junior’s TeamSnap record, each with their own private login. We’ll update you when this feature is ready to roll out, but to get ready for it, make sure to start adding those additional contacts to your Roster. Phew! Deep breath. This is a major overhaul of TeamSnap contacts and we hope you love it. 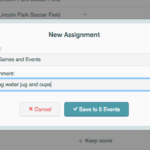 Try it out, see the possibilities and let us know if this makes TeamSnap an even better tool for you and your team. Happy playing!